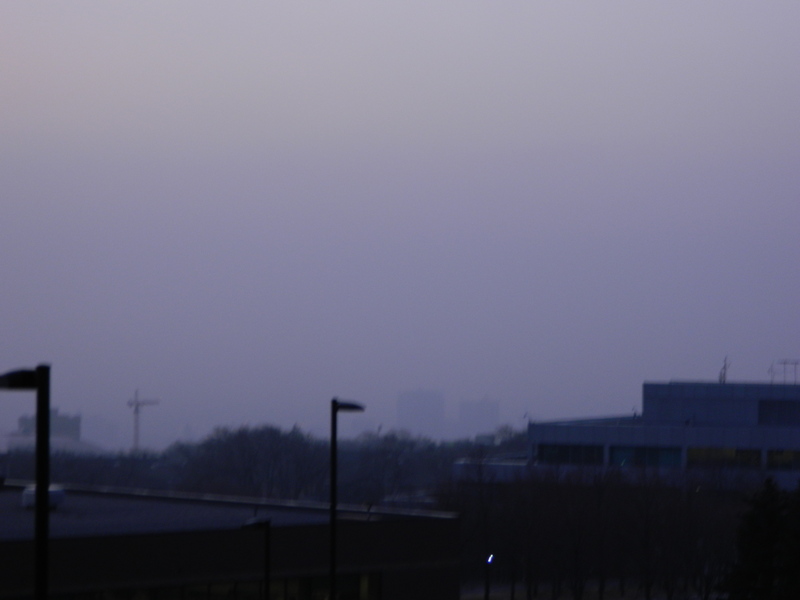 Salt Lake’s smog in February 2013. Though it seems like evening, this picture was taken around 3 p.m. The downtown buildings are somewhere in the haze. Candace and I returned to Salt Lake City over the holidays, and we were quite nervous for the trip. It wasn’t the usual holiday-induced, family-oriented stress that had us worried. Instead, we were scared of missing our former hometown, of feeling like we had made a mistake moving to the Northwest. There is plenty to miss about Salt Lake, and we were worried about being homesick. Then we saw the smog. Our concerns weren’t irrational. Salt Lake is a fantastic city, the urban and cultural center of a region dotted with incredible mountain ranges, red rock terrain, and some damn good skiing. As for the city itself, it’s a great town that will eventually challenge Denver as the top U.S. city in the Rockies. And Salt Lake, even more so than Seattle, enjoys ridiculous proximity to top-notch outdoor recreation. Salt Lake is a scenic wonder, has a good beer and dining scene, and is fairly diverse for a Western city. But what does it matter if you can’t see the town or smell the fresh air? For those of you who have never experienced it, Salt Lake’s smog is the worst in the country. When you combine 2 million people, their cars, and a mountainous geography that traps cold air, it’s a recipe for downright unhealthy breathing. When a high-pressure system sits over Salt Lake in the winter, the result is disgusting air that is only bested (worsted?) by China’s industry-heavy metropolitan areas. The soup hovering over Salt Lake on winter days is a dangerous substance. It’s made up of PM 2.5 particles, which are less than 2.5 micrometers in diameter — too small for your natural filters to pick up. Thus, every inhale deposits a swarm of fine particles on the lining of your lungs. And it’s especially thick. The EPA’s threshold for PM 2.5 is 35 micrograms per cubic meter. During January 2013, my last winter in Utah, areas of the Wasatch Front hit 190 micrograms per cubic meter, prompting comparisons to China’s oft-discussed smog. When the air gets this bad, the temperature at the valley floor (roughly 4,500 feet) can be 40 degrees colder than at 7,000 feet — something that happened last January. Furthermore, pregnant women are advised to stay indoors as the simple act of breathing Salt Lake’s air can harm a fetus. As you can imagine, this dangerous cloud isn’t aesthetically pleasing. At its worst, the gray is so thick that it hides the 9,000-foot peaks of the Wasatch range and reduces Salt Lake’s downtown buildings to a silhouette. The air smells like pennies and leaves your lungs questioning their natural function. Pregnant women are advised to stay indoors as the simple act of breathing Salt Lake’s air can harm a fetus. This toxic state is Salt Lake’s defining characteristic four months out of the year, and this is what I realized on my trip back. Of course I recognized the smog when I lived there, but it was just an inconvenience of the locality, not something that locals seemed offended by. Sure, there are Salt Lakers mobilizing against the smog, but by and large, people view it as the price you pay to live in Salt Lake. Now that I’ve moved away, I view it as the price that keeps someone (or a company) from the valley. Salt Lake is a thriving business center, but company managers who value the health of their employees can’t be impressed when they visit Salt Lake for a ski trip and can’t see the mountains. On a more personal level, the smog tarnished my visit. Seeing Mt. Olympus erupt to the east of Salt Lake is as visually stunning as seeing the Olympic mountains across the Puget Sound from Seattle. But I couldn’t see Olympus, nor could I make out Salt Lake’s prominent buildings until I was beneath them. Salt Lake is a wonderful area that has an incomparable urban-outdoor balance. But until one can breathe clean air year-round, it can’t crack the rank of the West’s top cities. We were worried about missing the snow and sunny weather of Utah. But if one can’t see the sun, I’d rather it be Seattle’s clouds than Salt Lake’s car emissions blocking its rays.